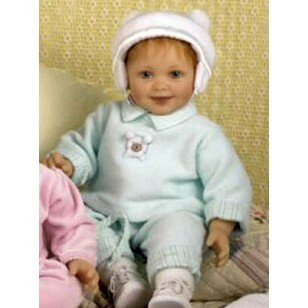 Limited Edition Davie Baby Doll - An adorable life-like 21" vinyl (1/4 limb) & cloth doll of extraordinary quality. Hand-painted, with green glass eyes, a red synthetic mohair wig, and weighted body. He comes dressed in an adorable outfit. Limited to an edition of 300, each hand-signed by the artist, Ann Timmerman. This Product has been discontinued and no longer available for purchase.